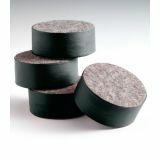 This felt-filled and leather-wrapped puck moves effortlessly across a gymnasium floor. Puck simulates the speed of a Shield Hotball®. 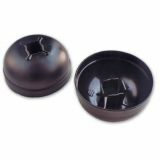 Because of the high quality construction, the puck will keep its shape for years. 1 dozen. Get in the game with the Champion Sports Hockey Puck. Our patented Hand Shield easily slips on all hockey shafts and moves up and down the shaft as the player moves hand positions. Protects hands from errant balls, pucks, and sticks. Makes hockey more enjoyable! Pack of 12. These safety features don't sacrifice speed. 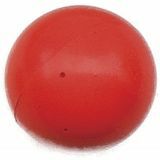 Vinyl, one-piece seamless construction, no bounce balls. For use on all surfaces and in all temperatures. Orange. 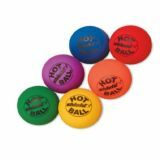 You'll have colorful play with these vinyl, one-piee seamless construction, no-bounce balls. Great on all surfaces and in all temperatures. Pack of 6 assorted. Get in the game with the Champion Sports Safe Soft Hockey Puck. 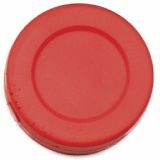 Soft vinyl, seamless, air-filled pucks promote safe play. For use on all surfaces and in all temperatures. 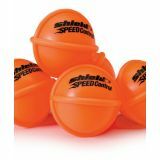 Finally, a ball that is faster that a plastic hockey puck, but slower that our Hotball®. 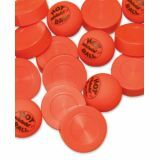 A one-piece, ribbed, seamless, no-bounce ball perfect for use on all surfaces and in all temperatures. Bright orange.